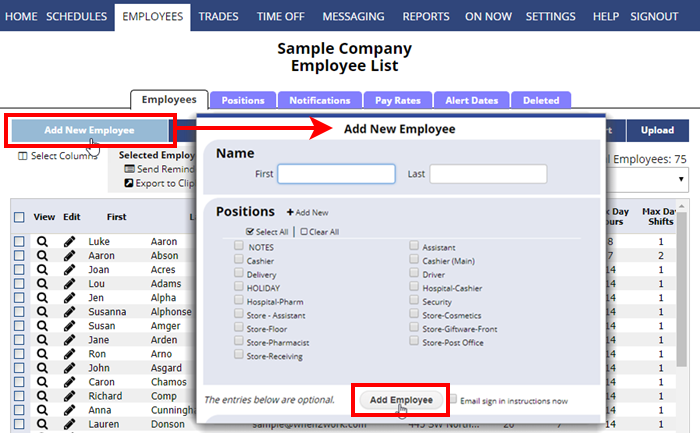 Add employees and set which Positions they can work (You can add other employee details now or later). All that is required is a first name or initials and the positions they can work. All other information is optional. Note: you can also upload a spreadsheet of employees. Enter a first and last name (or initials, nicknames, etc.) and check off the positions they can work. You will see confirmation that the employee was added and the window will remain open for you to add another employee. Click Close when you are finished adding employees and refresh/reload the page (Ctrl F5) to update it.